Four Seattle gallerists — James Harris, Greg Kucera, Robert Yoder and Mariane Ibrahim — trekked to New York recently for The Armory Show and its satellites, fairs that allow them to exhibit works to tens of thousands of people. As they grow ever more confident, the international art fairs — and the crowds of dealers, collectors, artists and spectators they attract — seem like a weird nomadic city unto themselves. During the first week of March, such a city settled in New York for The Armory Show, which is one of the biggest and most prestigious art fairs in the calendar. In New York, the art-fair phenomenon is particularly odd. After all, Manhattan and Brooklyn are already home to hundreds of galleries. But in the art world, more does not necessarily mean better. If you respond with anything like enthusiasm to one in five of the fair booths you should regard yourself as fortunate. In this context, Seattleites can take real pride in the fact that the four galleries from the city each put on splendid exhibits. At the Armory Show itself (where rental runs to almost $40,000 for a medium-size booth), James Harris Gallery presented Seattle heavyweight Gary Hill; at the Art Dealers Association of America ADAA)’s Art Show (where booths are more than $30,000), Greg Kucera Gallery showed David Byrd; and at the Volta fair (where booths cost up to $20,000), Season showed Peter Scherrer, and Mariane Ibrahim Gallery presented Maïmouna Guerresi. Yoder showed this audience an excellent exhibit of paintings by Bellingham artist Peter Scherrer. It is difficult to imagine art that speaks more directly of the Pacific Northwest, particularly the experience of nature. One of the standout pictures on the booth was “Ozette Hike.” Its beginnings were in an actual hike taken by Scherrer and his son, but as he explains, “The marks take over; it’s about pushing into abstraction.” Yoder had a couple dozen of Scherrer’s pieces in the booth, priced between $250 and $4,000 (only one piece sold). Utterly different, and to be honest, one of the most striking shows to be found in any of the fairs, was the Maïmouna Guerresi exhibit at the Mariane Ibrahim Gallery booth just a few feet away from Yoder’s. 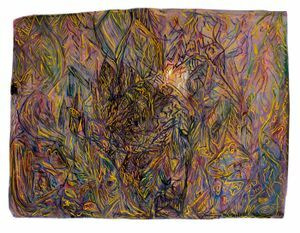 Guerresi will be the subject of the gallery’s first show in its new Second Avenue space and under its new name (it was previously the M.I.A. Gallery) later this month. This will be her first gallery exhibit in this country, and Seattle is in for a genuine treat. Guerresi was born an Italian Roman Catholic but reinvented herself when she discovered Sufism, the most mystical aspect of Islam. Her work concerns itself with spirituality as an aspect of real people’s lives, which is often expressed in their ability to defy gravity. The piece that got most attention here was probably “Supha,” a meditating figure floating peacefully up among the lighting tracks. This is clearly a special piece for Ibrahim. “Of course the ambition is to sell,” she admits. “Like everybody else, we have to cover our expenses. But there are pieces like this that you don’t want to sell. You just want to show them.” In the end, a number of pieces did sell, including some that weren’t actually in the booth but that collectors saw on the gallery’s website. 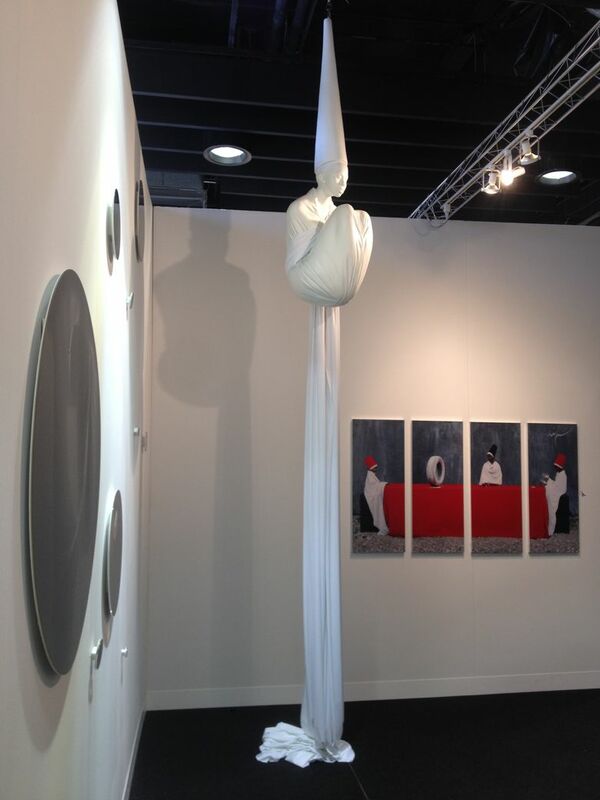 Greg Kucera had slightly more complex ambitions for his wonderful little show of David Byrd’s work at the ADAA fair. Byrd was a self-taught artist in rural New York and was entirely unknown until the enormously successful show of his haunting pictures that Kucera mounted at his Third Avenue gallery just before the artist’s death in April 2013. Though he sold three paintings for between $4,500 and $7,000 and was keeping three more on hold, Kucera said his first priority was finding a prestigious New York gallery with whom he can work to draw international attention to Byrd’s remarkable body of work. By the end of the fair he described himself as “astonished” at the amount of attention the works had drawn.